Learning About Sharks Dover Little Activity Books By Sovak, J. In This Easy-To-Read, Hands-On Guide For Young Naturalists, Author And Nature Illustrator Jan Sovak Introduces Children To One Of The Most Fascinating (And Most Feared) Of All Deep-Sea Creatures -The Shark. 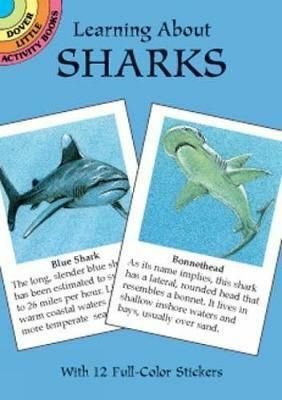 Each Page Of Text Describes Distinguishing Characteristics Of One Of 12 Different Species, Among Them The Odd-Looking Hammerhead And Extremely Rare Goblin Shark, The Great White Shark, As Well As The Sandbar, Silky, Bonnethead, Mako, Angel, Tiger, And Whitetip Sharks. Each Page Also Contains Space For A Peel-And-Apply Sticker. A Great Way To Combine Sticker Fun With Learning About These Ocean-Going Predators, This Little Book Will Also Appeal To Parents And Teachers In Search Of Inexpensive Learning Aids.